Three autonomous systems: AS 10 (R1), AS 20 (R2), and AS 30 (R3) merge into one AS 123. They will be running OSPF 1 Area 0 on internal links. 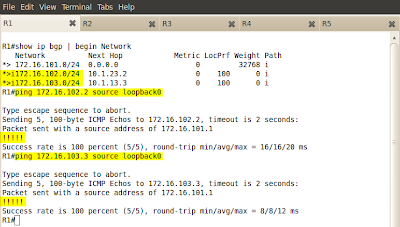 Configure OSPF and BGP on these routers in AS 123 and advertise their loopbacks into BGP. R4 is still configured to peer with AS 10 (R1) and AS 20 (R2). R5 is still configured to peer with AS 30 (R3). Make sure the peering works between them withouth changing configuration on R4 and R5. All routers in AS 123 should be able to reach prefixes advertised by AS 40 and AS 50. Pic. 2 - R3's BGP Peers. Pic. 3 - Connectivity Test on R1. Pic. 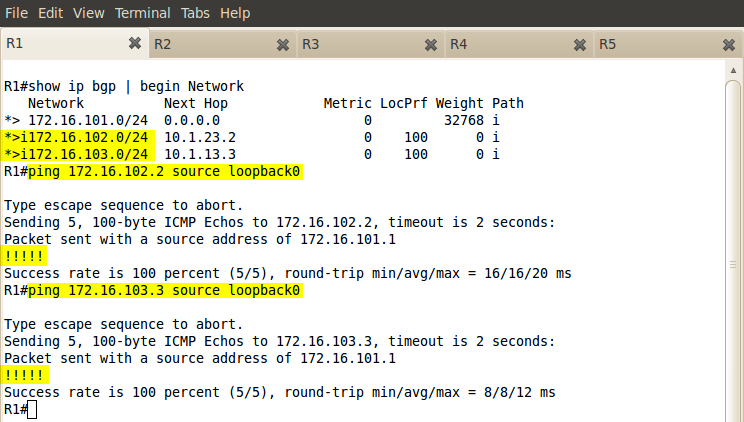 4 - R4's BGP Peering. Pic. 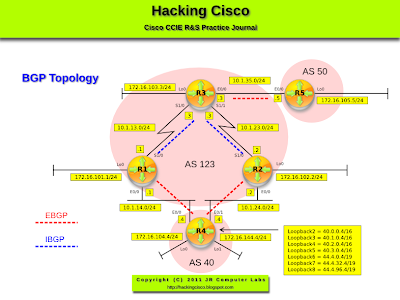 5 - R5's BGP Peering. Ping check: verified the reachability (no picture to make this post shorter).